The State Senate of Hawaii honors and commends APCRD. 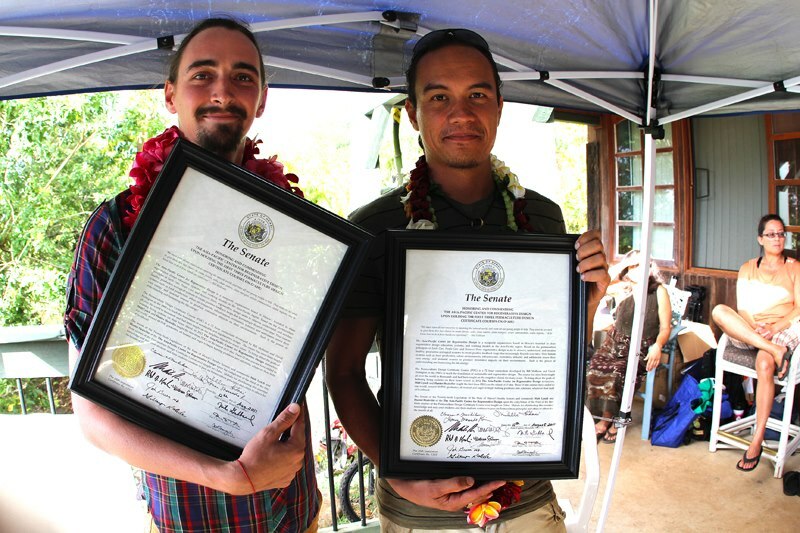 Browse: Home » The State Senate of Hawaii honors and commends APCRD. The State of Hawaii hereby honors and commends APCRD. The Asia-Pacific Center for Regenerative Design is a nonprofit organization based in Hawaii founded to share regenerative design education, systems & working models in the Asia-Pacific region. Based on the permaculture principles of Earth Care, People Care and Resource Share, regenerative design seeks to observe, understand, and emulate healthy, productive ecological systems to create positive feedback loops that increasingly flourish over time. Thus human systems such as food production, urban environments, infrastructure, economics, industry, and settlements renew their own energy and material sources to produce restorative impacts upon their environments. Such is the power of understanding and harnessing the life energy! The Permaculture Design Certificate Course (PDC) is a 72-hour curriculum developed by Bill Mollison and David Holmgren in the 1980s to teach the foundation of sustainable and regenerative design. The course has since been taught all over the world to thousands and had been taught on the neighbor islands for many years. To bring about the goals of bettering living systems on their home island, in 2012 The Asia-Pacific Center for Regenerative Design instructors Matt Lynch & Hunter Heaivilin taught the first three PDCs on the island of Oahu. These Oahu courses have added to our world, around 60 PDC graduates, all trained and eager to begin turning problems into solutions, whatever their field of livelihood. The Senate of the Twenty-Sixth Legislature of the State of Hawaii hereby honors and commends Matt Lynch and Hunter Heaivilin of The Asia-Pacific Center for Regenerative Design upon completion of the third of the first three courses of the Permaculture Design Certificate Course ever taught on Oahu. Mahalo for distributing this essential knowledge and may your students and their students continue to pass on Permaculture principles and ethics to others for the benefit of all. thank you for your support and all that you bring!